My family celebrates everything! Birthdays, anniversaries, achievements and mini life happenings in between. I guess you could say that was where my attitude towards “forgetting my birthday is unacceptable” came from, but I like that about us. A few months back, we had an anniversary to celebrate so we decided a family dinner was in order. Because of school, my siblings and I are only home a couple of times a year, this was a break where all of us were around plus a few cousins and uncles. Now if you have read my past restaurant reviews, you know that for me part of the fun of dining out is perusing the web to find a restaurant to go to. I’m usually left with this task because of that. But in this case it was difficult because there weren’t a lot of info about restaurants in Abuja—capital of Nigeria—online. So I did what every milenillial would’ve done, I consulted the Twittersphere! I got responses immediately and a few restaurants kept being repeated, one of which was Nkoyo. So I went online—again—and luckily there was a website linked to the restaurant. To cut the story short, it fit our criteria of family friendly, large group and a bonus of indian food! I immediately called in to make a reservation, this may not be necessary if you have a small group. 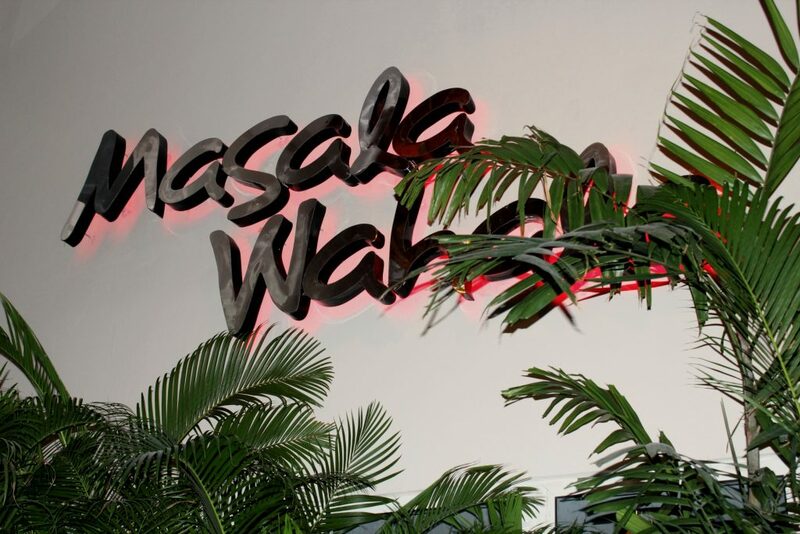 NKoyo you see, is a restaurant the serves Nigerian food and an addition called “Masala Wahala” that serves Indian food! My dad was a bit skeptical about the wahala part—translates to “trouble” in the hausa language—but we all liked the name and it got everyone excited. 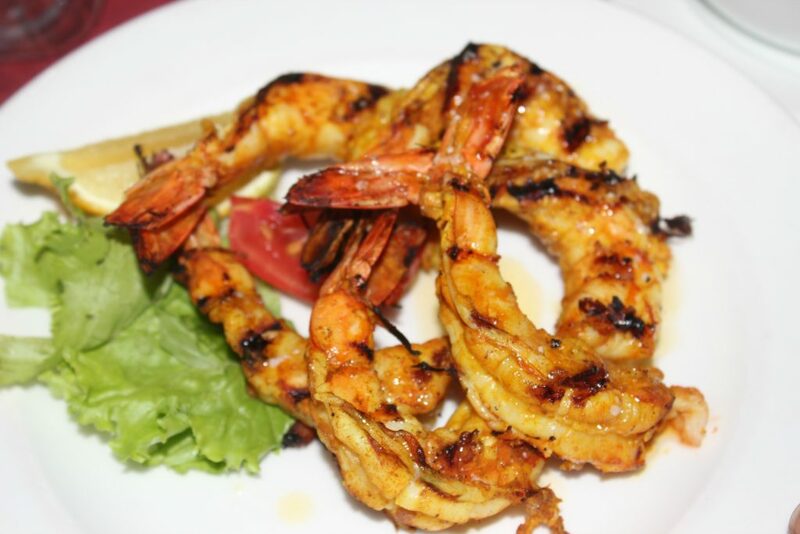 Prawns Ghee roast – This was hands down my fave starter, and this is coming from someone who doesn’t really like seafood. It had the right flavour and juice. 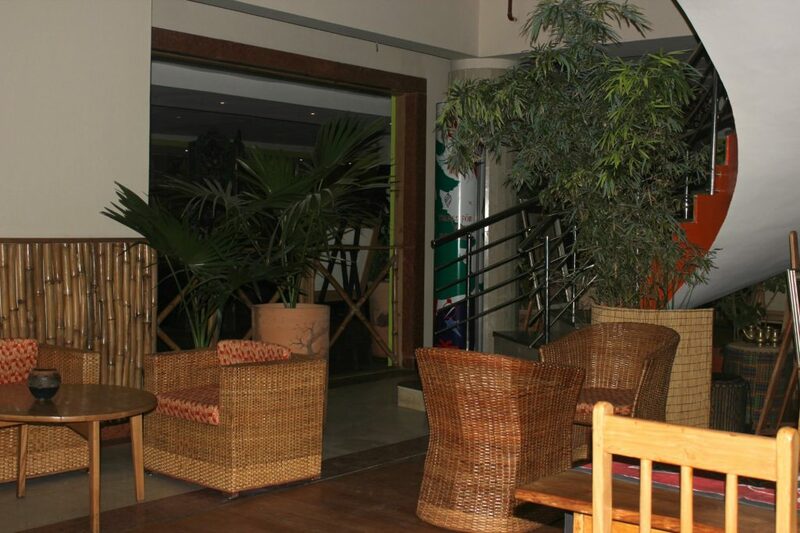 The restaurant is located on the top floor of ceddi plaza, and at first glance it looks like your run-of-the mill restaurant with traditional Nigerian Art scattered about, but then when you walk in to the indian section, the decor takes your breath away. 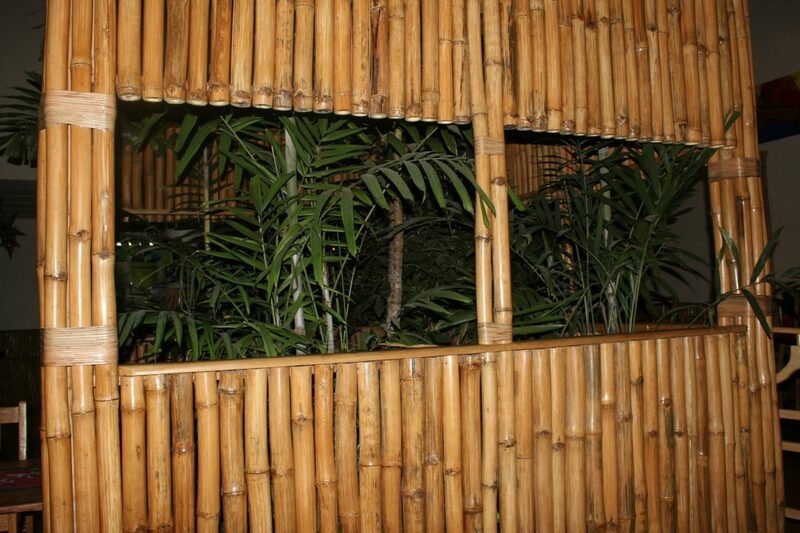 It is like walking into a jungle decorated in bamboo. 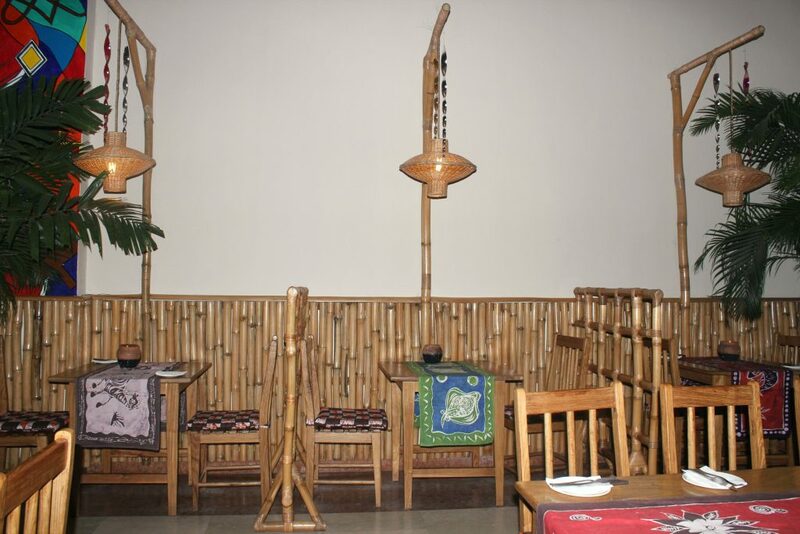 Everything from the chairs to the chandelier was made out of bamboo. Now that immediately put my dad at ease with his previous concern. We are in for a treat, I thought! Here is what we ordered for starter, because there was quite a few of us, we ordered each for both sides of the table. 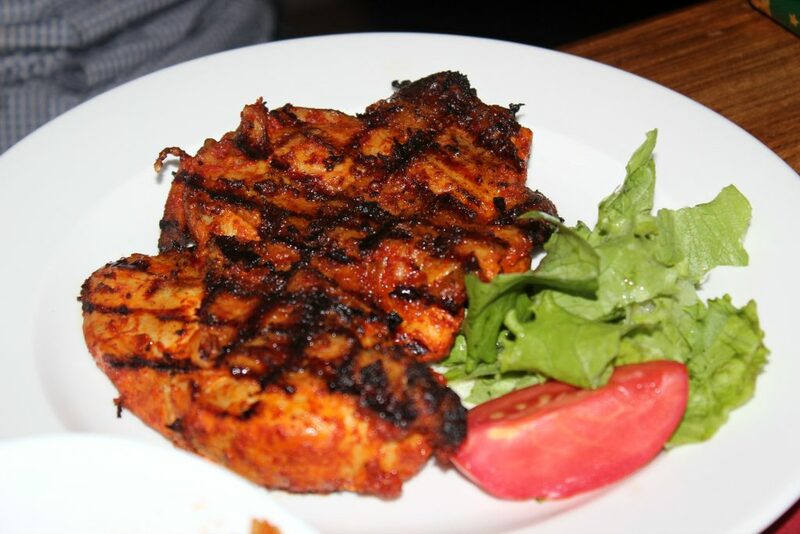 The portions are good for 3-4 people. 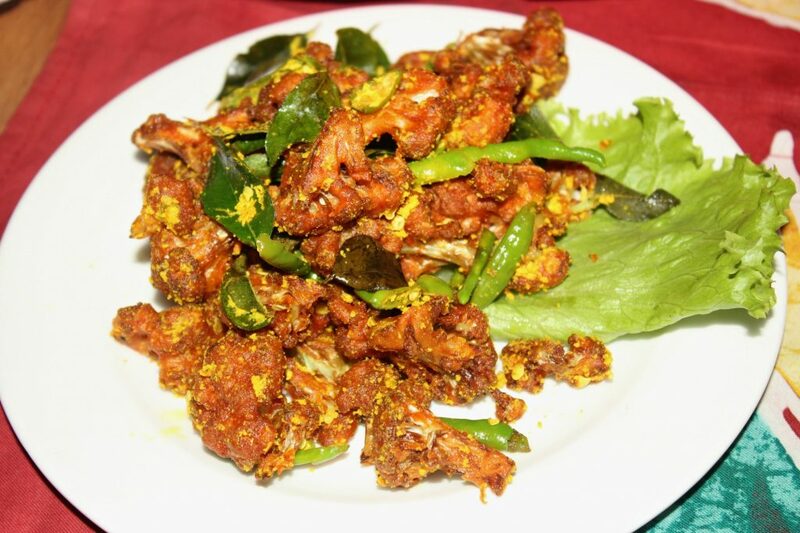 Cauliflower chilli fry – It is true what they say about cauliflower, it absorbs all the flavours. This was crispy and yum! 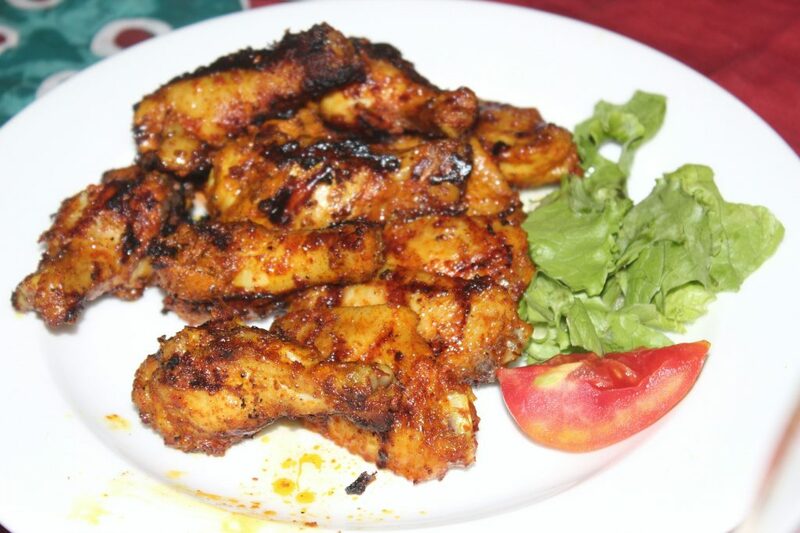 Grilled pepper wings – This had the right amount of spice for me, but it was a bit too greasy. And I wish there was more veggies. 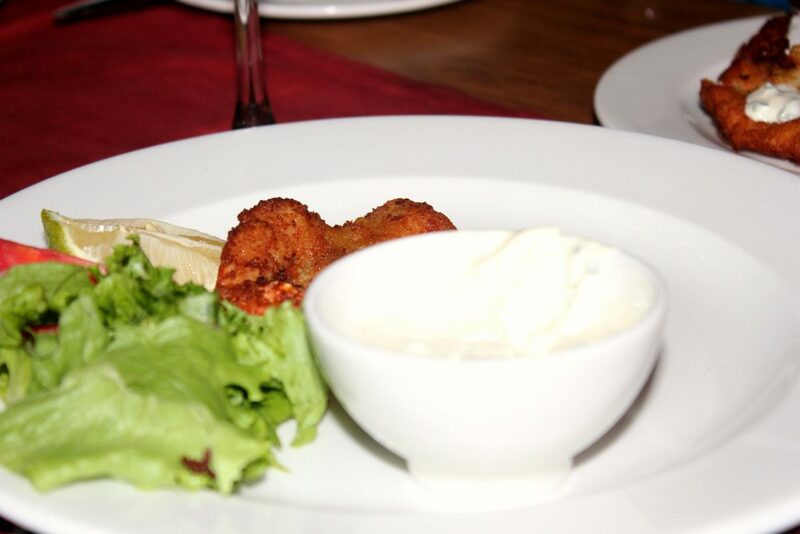 Crispy King Prawns breaded and served with lemon mayo – This is supposed to be half a dozen, but most o it was gone before I took the photo! At this point, someone started playing the piano and if I recall correctly, they played all through our meal which added to the fabulousness! 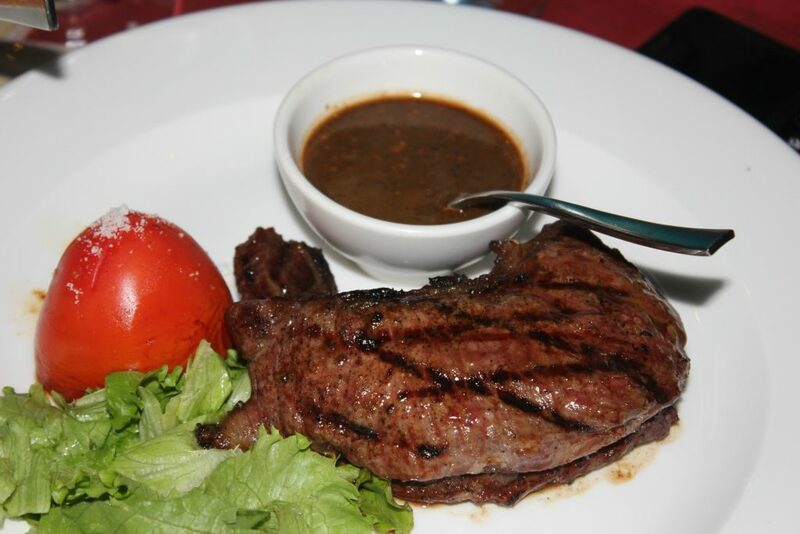 Fillet Steak with fries and fresh mushroom or peppercorn sauce – My brother’s verdict is that it was well cooked! 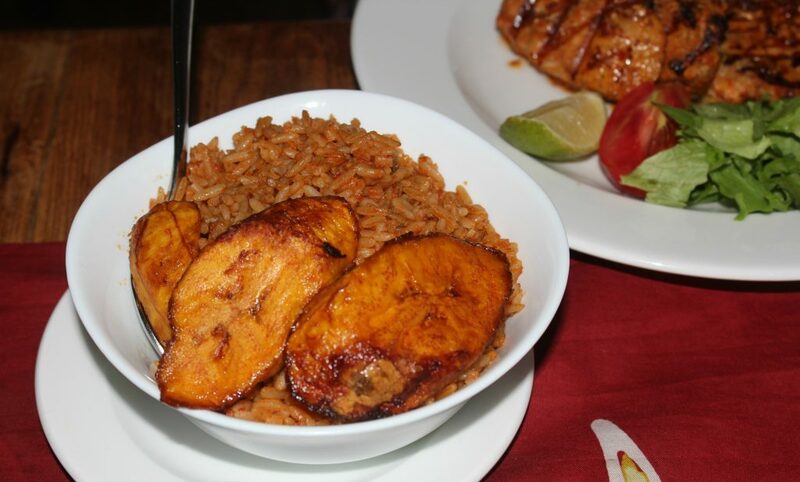 Jollof rice & Plantain – This is a side to the chicken below. 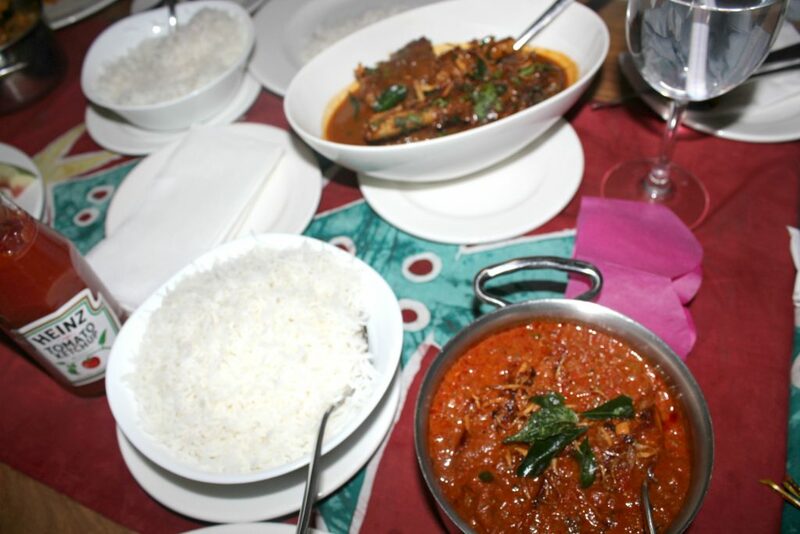 Lamb Nihari, Braised Lamb in aromatic indian spices – I wasn’t expecting a creamy curry which was a slight dissapointment but the taste was okay. I like the added flavour of the crispy onions. I don’t think I need to say a lot, see for yourself…This was a dinner therefore the lighting was not favourable for photos an there were other diners so I couldn’t take a full shot of the restaurant but this little I have below does say a lot! We had the biggest table in the room which was smack in the middle. The seating photographed above is for smaller groups. The whole restaurant had an outdoorsy ambience to it. Awesome review. I love me some Nkoyo! Good one Meera. I never expected a south Indian restaurant to be in nigera . 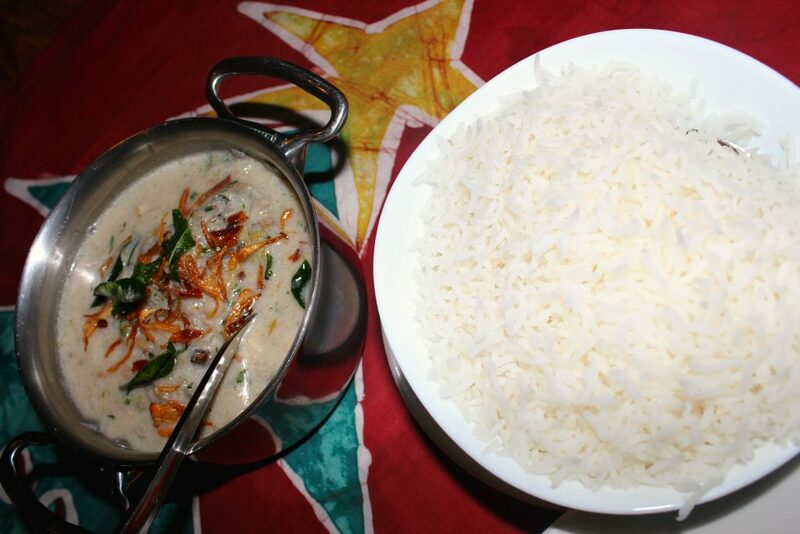 As for that milagu kozhi chettinaadu is a spicy one which I too like . Milagu means pepper and kozhi means chicken in Tamil language. Chettinaadu is a place in Tamil Nadu. Expecting more interesting things ^^. 화이팅 !! !